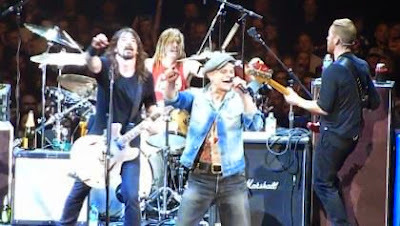 David Lee Roth performed a pair of Van Halen classics with Foo Fighters at The Forum in Los Angeles on Saturday. Roth joined the band late in the show for “Panama” from “1984” and “Ain’t Talkin’ ‘Bout Love” from their self-titled 1978 debut. “And a great night was had by all”, posted Roth after the concert. The Van Halen frontman was among the guests for Dave Grohl’s early birthday party (he’ll turn 46 on January 14); the evening also saw performances by Paul Stanley of KISS, Alice Cooper, Perry Farrell, Slash, Zakk Wylde, Tenacious D and Lemmy from Motorhead. Essentially serving as a warm-up date for the Foos South American tour – which starts next week – proceeds from the show will benefit three music-releated charities: Rock School Scholarship Fund, MusiCares and Sweet Relief.